Just over one year ago, US Deputy Attorney General Sally Yates issued new guidance to Department of Justice (DOJ) attorneys, emphasising individual accountability in all investigations of corporate misconduct. Although the Yates Memo has not yet led to a meaningful uptick in individual criminal prosecutions under the Foreign Corrupt Practices Act (FCPA), it lays the groundwork for more even-handed enforcement of the statute and proposes a system of justice that treats corporate executives the same as other criminal wrongdoers. Whether the DOJ can turn that rhetoric into reality remains to be seen. Released on 9 September 2015, the Yates Memo outlined six key steps that prosecutors are expected to take in any investigation of corporate misconduct to most effectively “pursue the individuals responsible for corporate wrongs”. The most significant step requires companies to provide the DOJ with all relevant facts relating to the individuals responsible for corporate misconduct to qualify for any cooperation credit. The concept that corporate cooperation includes providing the government with all relevant facts about individual wrongdoers is nothing new; individual accountability has long been a stated priority at the Department of Justice. What is new is the consequence of not providing this information. In the wake of the Yates Memo, divulging all information about the individuals responsible for corporate misdeeds is a threshold requirement for receiving any cooperation credit at all. The DOJ has since clarified that a company can be eligible for cooperation credit even if it is “unable to identify the culpable individuals following an appropriately tailored and thorough investigation”, so long as it “provides the government with the facts and otherwise assists [the government] in obtaining evidence.” The DOJ has also indicated that, going forward, all corporate plea and settlement agreements will include a provision that requires the companies to continue to provide relevant information to the government about any individuals implicated in the wrongdoing and that a company’s failure to continue cooperating against individuals will be considered a material breach of the agreement and grounds for revocation or stipulated penalties. Following the release of the Yates Memo, the DOJ implemented a pilot programme designed “to promote greater accountability for individuals and companies that engage in corporate crime by motivating companies to voluntarily self-disclose FCPA-related misconduct, fully cooperate with the Fraud Section [of the Department of Justice] and, where appropriate, remediate flaws in their controls and compliance programs”. Companies that self-disclose, fully cooperate, including by providing information about individual wrongdoers, remediate and disgorge all profits resulting from the FCPA violations will qualify for mitigation credit that can affect the type of disposition, the amount of fine imposed, or the determination of the need for a monitor. In order to put the Yates Memo in context and to understand both its significance and potential impact, it is important to take a closer look at the DOJ’s historical record of prosecuting individuals for FCPA offences. In the last five years, the DOJ has criminally prosecuted 60 individuals for FCPA-related offences and 40 individuals for violating the anti-bribery, books and records and/or internal controls provisions of the FCPA. During this same time period, the DOJ prosecuted 39 corporate groups for FCPA violations. 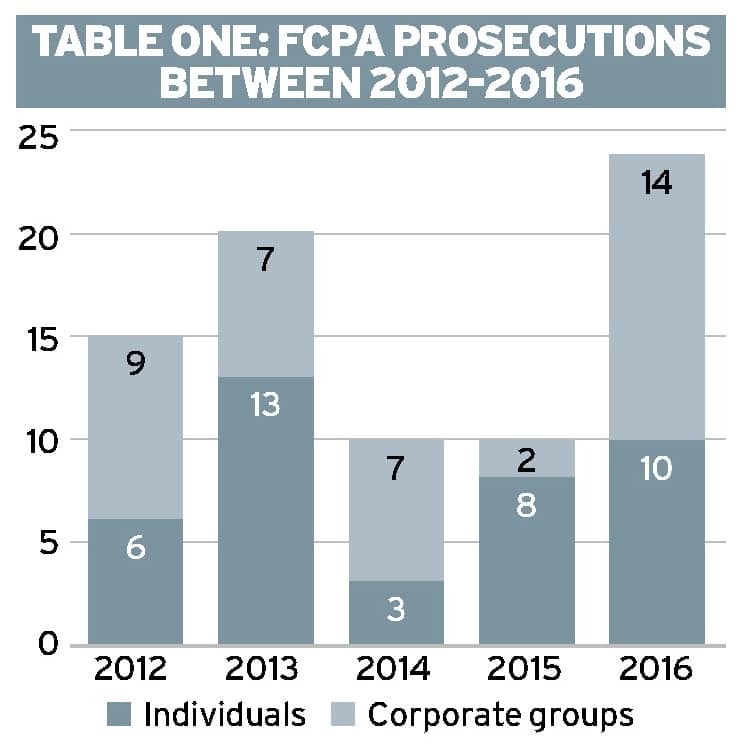 Table One (below) details the number of criminal FCPA prosecutions per year between 2012 and 2016. According to publicly available documents, the DOJ criminally charged ten individuals with FCPA offenses in 2016. While the absolute number of individual defendants increased last year, the ratio of individual to total defendants actually declined. In 2016, individuals represented 42 per cent of all FCPA defendants, which is far below the 2015 ratio (80 per cent) and slightly below the five-year average of 51 per cent. and that no person employed by any of the 23 public companies has been criminally prosecuted to date. In the early years of FCPA enforcement, simultaneous prosecution of companies and company agents was the norm rather than the exception. Between the FCPA’s enactment in 1977 and the end of 2004, 83 per cent of criminal enforcement actions against companies involved a related criminal prosecution of individuals. Those numbers have flipped in recent years. Between 2012 and 2016 inclusive, the DOJ criminally charged 39 corporate groups with FCPA violations. Only six of those prosecutions (or 15 per cent) have involved related criminal enforcement actions against company employees or agents. That means that 85 per cent of corporate prosecutions initiated in the past five years have involved no related criminal action against the employees or agents who caused or facilitated the FCPA violations. If you add to the mix three recent pilot programme declinations that terminated investigations against corporate groups despite alleged anti-bribery violations, then the percentage of corporate actions involving a related individual prosecution goes down even further, to 14 per cent. Given the universally recognised truism that “corporations do not act criminally, but for the actions of individuals”, why aren’t more individuals being criminally prosecuted for corporate FCPA offences? There are several possible explanations. 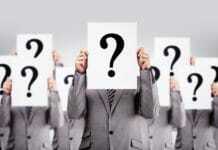 To begin with, holding company employees criminally liable for FCPA offences can prove tricky. Prosecutors must establish the requisite knowledge and intent “beyond a reasonable doubt” and not by the “preponderance of the evidence” standard that governs civil cases in the United States. 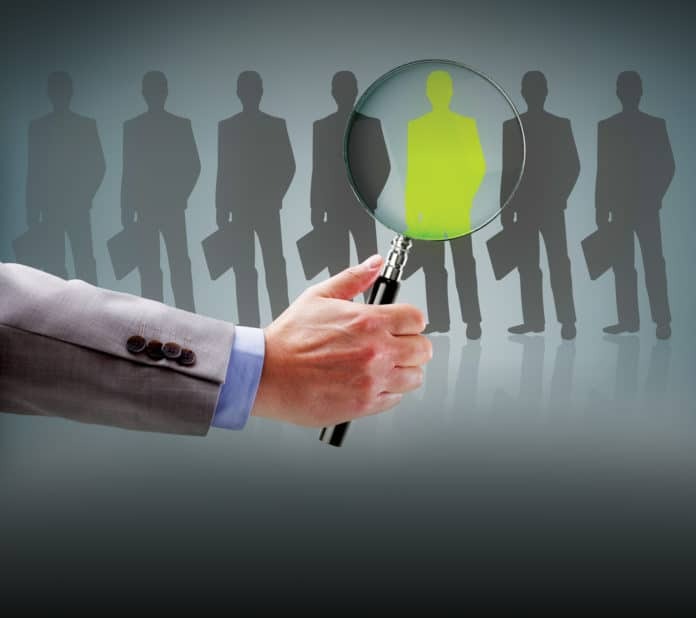 When the misconduct occurs at a large corporate enterprise, it can be difficult to determine who carried out the criminal acts and who was ultimately responsible for the business decisions at issue. 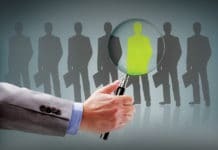 High-ranking executives can be particularly difficult to prosecute if they are removed by several layers from the day-to-day operations of the enterprise. Even if an individual is identified, he or she may be responsible for only a small portion of a large, complex bribery scheme that could span several continents and multiple affiliated entities. Prosecutors may be further constrained by legal restrictions on the production of documents from companies that operate globally, including restrictive foreign data privacy laws and a limited ability to compel the testimony of witnesses abroad. In addition, the very length of investigations – which often drag out for several years – can make it difficult for prosecutors to bring criminal charges against individual defendants before the statute of limitations expires. The DOJ may also decline to criminally prosecute individuals who are subject to ongoing or imminent litigation initiated by another US or foreign agency. In fact, the clear majority of individuals charged with FCPA-related misconduct have been sued by only one US agency or the other, whether due to agency deference, lack of jurisdiction, or inability to establish criminal intent. However, the prospect of parallel enforcement has not stayed all criminal prosecutions. Since the FCPA’s enactment, 28 individuals have been charged by both the SEC and the DOJ for FCPA-related offences. More fundamentally, enforcement actions against companies may not lead to criminal prosecution of company employees if there is insufficient evidence that an FCPA violation occurred, notwithstanding the company’s admission of wrongdoing. Companies almost universally settle FCPA claims to avoid the severe consequences that may result from criminal conviction, including reputational harm, delicensing, debarment from government contracts, or exclusion from federal programmes, and to access the reduced fine and other ‘carrots’ offered by the government to cooperating companies. Critics contend that DPAs and NPAs may be predicated on scanty facts and legal conclusions that are never challenged in a court of law or subject to exacting judicial scrutiny. They argue that these alternative forms of resolution allow the government to exact disproportionate remedies from corporate offenders for conduct that may not amount to a provable FCPA violation. Prosecutors have significantly less leverage over individuals. Faced with the prospect of heavy fines, incarceration, or both, individuals are much more likely to challenge FCPA claims, especially those based on thin facts or questionable jurisdictional grounds. Prosecutors may be reluctant to pursue individual wrongdoers based on the same facts and legal theories that support a corporate resolution because they know there is a higher likelihood that the theories will be examined, and possibly rejected, in a court of law. In fact, empirical evidence suggests that as corporate DPAs and NPAs have increased in popularity, the number of corporate enforcement actions involving a related individual prosecution has declined precipitously. As Table One reveals, the Yates Memo has not yet led to a meaningful uptick in individual prosecutions for FCPA offences. Does this mean the Yates Memo has failed? Not at all. Prosecutors require time to incorporate the memo’s directives into their policies and procedures and to translate those directives into new enforcement actions. Investigations commenced around the time of the memo’s release are thus likely to be more substantially impacted by the memo than are investigations that were already well-established when the policy shift was announced. Whether the Yates Memo will ultimately lead to more individual prosecutions remains an open question. Individual accountability has long been a touchstone of criminal enforcement, yet the number of corporate prosecutions with a simultaneous prosecution of managerial agents has dwindled in recent years. This is despite public outcry over the dearth of individual prosecutions in the wake of the financial crisis and increased public pressure to criminally charge individual wrongdoers. Even if the Yates Memo does reflect a significant policy change, there is no guarantee that company employees will be prosecuted. So long as the DOJ continues to push the scope and jurisdictional bounds of the FCPA through corporate DPAs and NPAs, the DOJ may be disinclined to risk judicial scrutiny of expansive legal theories or flimsy evidence in a prosecution of company employees, even if the company admits to wrongdoing and hands over all relevant information about culpable individuals. On the other hand, the Yates Memo could curb some of the perceived excesses of FCPA enforcement. By focussing on individuals from the outset of an investigation, including the factual and legal grounds necessary to support an individual indictment, the memo could encourage prosecutors to spend more of their energy on cases with provable FCPA violations and less time on cases of questionable merit. The memo could also yield tangible benefits in the form of additional deterrence. Individuals faced with a higher prospect of criminal prosecution – including significant fines and jail time – may be less inclined to sanction bribery payments, or to hide those payments in the company’s books and records. And those individuals could, in turn, effect positive change within the corporate culture. At the very least, the DOJ’s stated intent to focus on individuals from the outset of an investigation and the demonstrated willingness of companies investigated for FCPA-related misconduct to share information about culpable individuals with the government, suggests that white-collar criminal investigations may be moving in the right direction. Whether the new policies will correct the imbalance in criminal enforcement of the FCPA remains to be seen. Sally Quillian Yates, Individual Accountability for Corporate Wrongdoing 2 (Sept. 9, 2015), http://www.justice.gov/dag/file/769036/download (hereinafter, “Yates Memo”). The Yates Memo also requires all corporate investigations to focus on individuals from the inception of the investigation, encourages increased coordination between the DOJ’s criminal and civil divisions and urges civil prosecutors to evaluate whether to bring suit against an individual based on considerations beyond that individual’s ability to pay a money judgment. Id. at 4-7. The memo further directs that prosecutors should not release individuals from civil or criminal liability when resolving a matter with a corporation except in extraordinary circumstances and that prosecutors must obtain approval from the office that handled the investigation if they decide not to bring charges against individuals. Id. at 5-6. See, e.g., Eric H. Holder, Jr., Attorney General, U.S. Dep’t of Justice, Remarks on Financial Fraud Prosecutions at NYU School of Law (Sept. 17, 2014), available at https://www.justice.gov/opa/speech/attorney-general-holder-remarks-financial-fraud-prosecutions-nyu-wschool-law(“[T]he department [of justice] recognises the inherent value of bringing enforcement actions against individuals, as opposed to simply the companies that employ them.”); Sally Q. Yates, Deputy Attorney General, U.S. Dep’t of Justice, Remarks at the New York City Bar Association White Collar Crime Conference (May 10, 2016), available at https://www.justice.gov/opa/speech/deputy-attorney-general-sally-q-yates-delivers-remarks-new-york-city-bar-association(“[H]olding individuals accountable for corporate wrongdoing has always been a priority for the Department of Justice … The principles of federal prosecution of business organisations had long provided that companies that want cooperation should identify who did what. That concept has been repeated by department officials over and over again for the last several years in just about every speech given on corporate fraud.”). See Yates Memo, supra note 1, at 3 (“Once a company meets the threshold requirement of providing all relevant facts with respect to individuals, it will be eligible for consideration for cooperation credit.”). Leslie R. Caldwell, Assistant Attorney General, U.S. Dep’t of Justice, Remarks at the Second Annual Global Investigations Review Conference (Sept. 22, 2005), available at https://www.justice.gov/opa/speech/assistant-attorney-general-leslie-r-caldwell-delivers-remarks-second-annual-global-0. See Sally Q. Yates, Deputy Attorney General, U.S. Dep’t of Justice, Remarks at the NYU School of Law Announcing New Policy on Individual Liability in matters of Corporate Wrongdoing (Sept. 10, 2015), available at https://www.justice.gov/opa/speech/deputy-attorney-general-sally-quillian-yates-delivers-remarks-new-york-university-school. See U.S. DEP’T OF JUSTICE, THE FRAUD SECTION’S FOREIGN CORRUPT PRACTICES ACT ENFORCEMENT PLAN AND GUIDANCE 2 (Apr. 5, 2016) (hereinafter, “DOJ ENFORCEMENT PLAN”). Id. at . The DOJ has publicly released five declination letters since the launch of the pilot programme. Each of the letters references, among other things, the company’s cooperation and voluntary remedial measures as a basis for the Department’s decision to close the investigation despite allegations of bribery. Three declination letters were issued in connection with parallel SEC enforcement actions that included a disgorgement payment to the Commission. The two more notable declinations involved private companies over which the SEC lacked jurisdiction. Those letters included a detailed recitation of the government’s findings of wrongdoing, were counter-signed by company representatives, and required the companies to disgorge to the DOJ all ill-gotten profits. These “declinations with disgorgement” appear to be a new category of FCPA resolution, and they are counted as enforcement actions for purposes of the enforcement statistics. The DOJ has 8 Data conforms to the calendar year. The DOJ’s fiscal year runs from October 1 through September 30. Eighteen Twenty individuals were charged under related statues for crimes such as money laundering, wire fraud and travel act violations. Eleven of these individuals were foreign government officials who allegedly accepted bribes. As used herein, a corporate group includes a parent entity and its subsidiaries and joint ventures. The DOJ can and often does prosecute more than one entity within a single corporate group. For example, the DOJ might charge a subsidiary with anti-bribery violations and a parent entity with violating the FCPA’s books and records provisions. The 39 corporate groups identified above actually represent 534 entity defendants. In the first two weeks of 2017, the DOJ criminally charged two additional corporate group (Zimmer Biomet and Sociedad Quimica y Minera de Chile S.A.) and three additional individual defendants with FCPA-related offenses. See Press Release, U.S. Dep’t of Justice, Zimmer Biomet Holdings Inc. Agrees to Pay $17.4 Million to Resolve Foreign Corrupt Practices Act Charges (Jan. 12, 2017); Press Release, U.S. Dep’t of Justice, Chilean Chemicals and Mining Company Agrees to Pay More than $15 Million to Resolve Foreign Corrupt Practices Act Charges (Jan. 13, 2017); Press Release, U.S. Dep’t of Justice, Two Businessmen Plead Guilty to Foreign Bribery Charges in Connection with Venezuela Bribery Schemes (Jan. 10, 2017); Complaint, United States v. Woo, No. 17-mj-00139 (S.D.N.Y. Jan 10, 2017).REPLACE WITH NEW FOOTNOTE 11. SEE RIDER 1. Vicente Eduardo Garcia is included as one of the individuals who is affiliated with a public company. Although the criminal information identifies Garcia as an employee of SAP International, a private subsidiary of the issuer SAP SE, the SEC’s cease-and-desist order notes that “SAP presented [Garcia] to customers as an SAP employee.” See Exchange Act Release No. 77005, Order Instituting Cease-and-Desist Proceedings ¶ 8, In the Matter of SAP SE (Feb. 1, 2016). In a small number of cases, individuals employed by or affiliated with a subsidiary of a public company were criminally charged with FCPA violations. See, e.g., Case Information, United States of America v. Frederic Pierucci, et. al., FOREIGN CORRUPT PRACTICES ACT CLEARINGHOUSE, http://fcpa.stanford.edu/enforcement-action.html?id=15 (last visited Jan. 12, 2017) (observing that persons employed at Alstom subsidiaries were charged with, among other things, anti-bribery violations). See Mike Koehler, Measuring the Impact of Non-Prosecution and Deferred Prosecution Agreements on Foreign Corrupt Practices Act Enforcement, 49 U.C. DAVIS L. REV. 497, 541 (2015). In the first few weeks of 2017, the DOJ criminally prosecuted onetwo additional corporate groups – Zimmer Biomet Holdings, Inc. and Sociedad Quimica y Minera de Chile S.A. See supra note 11. As of January 123, 2017, no company agents or employees had been prosecuted in connection with this misconducteither of these matters. These numbers are based on data culled from the Foreign Corrupt Practices Act Clearinghouse and analysed by the author. The six corporate actions with a related individual prosecution involve Alstom, Bizjet International Sales & Support, Inc., HMT LLC, IAP Worldwide Services, Inc., Louis Berger International, Inc., and Och-Ziff Capital Management Group LLC. Notably, the two HMT employees were not even charged with FCPA offenses. Some of the individuals responsible for these misdeeds may yet be prosecuted in the coming months or years, perhaps as the result of ongoing cooperation from their corporate employers. See SungHee Suh, Deputy Assistant Attorney General, U.S. Dep’t of Justice, SungHee Suh Speaks at the PLI’s 14th Annual Institute on Securities Regulation in Europe: Implications for U.S. Law on EU Practice (Jan. 20, 2015), available at https://www.justice.gov/opa/pr/deputy-assistant-attorney-general-sung-hee-suh-speaks-pli-s-14th-annual-institute-securities. The FCPA’s anti-bribery provisions include three scienter requirements: 1) any violation must be done “corruptly,” see 15 U.S.C. § 78dd-1(a); 2) for criminal penalties to be imposed on an individual, the individual must have acted “willfully,” see 15 U.S.C. § 78ff(c)(2); and 3) if liability is premised on a payment to a third party, the payment must have been made “while knowing” that the money or thing of value would be provided in whole or part to a foreign official, see 15 U.S.C. § 78dd-1(a)(3); 15 U.S.C. § 78dd-2(a)(3); 15 U.S.C. § 78dd-3(a)(3). The accounting provisions provide that criminal liability will attach only if the individual “knowingly” falsified a book, record, or account of the issuer, or “knowingly” circumvented or failed to implement a system of internal controls. See 15 U.S.C. § 78m(b)(5). For a detailed discussion of the FCPA’s scienter requirements, see David P. Burns & Erin K. Sullivan, Navigating the FCPA’s Complex Scienter Requirements, BLOOMBERG FINANCE L.P. (Apr. 1, 2009). See, e.g., In re Winship, 397 U.S. 358, 361 (1970) (“The requirement that guilt of a criminal charge be established by proof beyond a reasonable doubt dates at least from our early years as a Nation.”). See Yates, Remarks at the New York City Bar Association White Collar Crime Conference, supra note 2 (discussing some of the challenges of criminally prosecuting individuals). Companies may use these restrictions to thwart even the lawful production of information. See, e.g., Marshall L. Miller, Principal Deputy Assistant Attorney General for the Criminal Division, U.S. Dep’t of Justice, Remarks at the Global Investigation Review Program (Sept.17, 2014), available at http://www.justice.gov/criminal/pr/speeches/2014/crm-speech- 1409171.html(stating that “[c]orporations are often too quick to claim that they cannot retrieve overseas documents, e-mails, or other evidence regarding individuals due to foreign data privacy laws”). 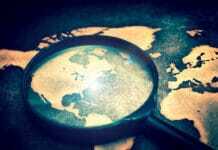 See Brian Whisler & Trevor N. McFadden, Why DOJ Struggles to Convict Individuals in FCPA Cases, GLOBAL COMPLIANCE NEWS (Sept. 10, 2015), http://globalcompliancenews.com/why-doj-struggles-to-convict-individuals-in-fcpa-cases-published20150910/ (“While the prosecutors ferret out misconduct in various corners of the corporate enterprise, the statute of limitations against individual employees continues to run, limiting prosecutors’ ability to bring charges for old crimes.”). In an effort to appear cooperative, companies may agree to toll the statute of limitations during the course of the government’s investigation. See, e.g., Avon Products, Inc., Annual Report at 15 (Form 10-K) (Feb. 25, 2010) (disclosing that the company signed tolling agreements in connection with SEC and DOJ investigations into FCPA compliance in China and other countries). For obvious reasons, individuals may be less inclined to sign tolling agreements that could lead to imprisonment or heavy monetary sanctions. As of November 20, 2016, only three entities have litigated an FCPA claim against the government. Harris Corporation was indicted in 1990. The case proceeded to trial and Harris was acquitted on all counts in 1991. See Case Information – Summary, United States of America v. Harris Corporation, FOREIGN CORRUPT PRACTICES ACT CLEARINGHOUSE, http://fcpa.stanford.edu/enforcement-action.html?id=15(last visited Jan. 12, 2017). Lindsey Manufacturing Corporation, a privately held California company, was indicted in 2010 and convicted on all counts in a jury trial shortly thereafter. However, in 2011, the court vacated the conviction on the grounds of prosecutorial misconduct. See United States v. Aguilar Noriega, et al., 831 F.Supp.2d 1180, 1210 (N.D. Cal. 2011) (vacating convictions and granting motion to dismiss the indictment). Cinergy Telecommunications was indicted on July 12, 2011 and entered a plea of not guilty. See Arraignment Information Sheet, United States v. Cinergy Telecommunications, Inc., Case No. 09-21010 (S.D. Fla. Oct. 13, 2011). On February 24, 2012, the court ordered the charges against Cinergy dismissed with prejudice after the DOJ elected not to go to trial based on a finding that Cinergy was in fact then non-operational, had no employees and had no assets of any real value. See Case Information – Summary, United States of America v. Joel Esquenazi, et. al, FOREIGN CORRUPT PRACTICES ACT CLEARINGHOUSE, http://fcpa.stanford.edu/enforcement-action.html?id=264(last visited Jan. 12, 2017). See Whisler & McFadden, supra note 24 (“Given the enormous litigation and reputational risk, companies are generally averse to contesting criminal charges at trial.”). 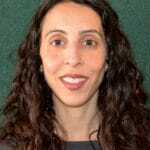 See Assaf Hamdani & Alon Klement, Corporate Crime and Deterrence, 61 STAN. L. REV. 271, 278-82 (2008) (observing that firms in regulated industries can lose their licenses as a result of a conviction). See 48 C.F.R. § 9.406-2 (2010) (causes for debarment); Peter R. Reilly, Justice Deferred is Justice Denied: We Must End Our Failed Experiment in Deferring Corporate Criminal Prosecutions, 2015 B.Y.U. L. REV. 307, 320-21 (2015) (discussing the risks of debarment and exclusion). See Reilly, supra note 28, at 320-21. See generally DOJ ENFORCEMENT PLAN, supra note 6. Between January 1, 2012 and December 31, 2016, 334 of 389 corporate groups (87%) sued by the DOJ for FCPA offenses resolved at least some of their claims through a DPA or NPA, although several of these settlements included a plea agreement as well. See Reilly, supra note 28, at 312-13. See Koehler, supra note 14, at 505-06 (citing U.S. GOV’T ACCOUNTABILITY OFFICE, GAO-10-110, CORPORATE CRIME: DOJ HAS TAKEN STEPS TO BETTER TRACK ITS USE OF DEFERRED AND NON-PROSECUTION AGREEMENTS, BUT SHOULD EVALUATE EFFECTIVENESS 25 (2009) (finding that “judges reported they were generally not involved in the DPA process.”)). To be fair, critics have argued that many plea agreements are rubber stamped as well. See, e.g., Daniel S. McConkie, Judges as Framers of Plea Bargaining, 26 STAN. L. & POL’Y REV. 61, 66 (2015) (“Judges ensure that the plea is ‘knowing’ and ‘voluntary’ but essentially rubberstamp most plea agreements.”). See Koehler, supra note 14, at 505 (noting that NPAs and DPAs “generally include a brief, often times bare-bones, statement of facts replete with legal conclusions that the company acknowledges responsibility for”); Whisler & McFadden, supra note 24 (observing that through settlement, “the Justice Department has been able to advance expansive views regarding the scope and applicability of the FCPA largely unhindered by skeptical juries and contrary case law.”); Gordon Bourjaily, Note, DPA DOA: How and Why Congress Should Bar the Use of Deferred and Non-Prosecution Agreements in Corporate Criminal Prosecutions, 52 HARV. J. ON LEGIS. 543, 547 (2015) (“DPAs undermine the rule of law by facilitating a shadow system of adjudications away from any oversight.”). See Koehler, supra note 14, at 544 (observing that “NPAs and DPAs do not necessarily represent provable FCPA violations but contribute to a façade of FCPA enforcement.”); Reilly, supra note 28, at 350-51 (“I believe a system has been created, through the workings of the DOJ, wherein even good, honest prosecutors who are trying to be reasonable and fair, could mistakenly decide to offer a DPA to a company that has not violated the law. Furthermore, any rationally minded company placed in that position, even if completely innocent, might reasonably choose to accept the offer.”); Peter Spivack & Sujit Raman, Regulating the ‘New Regulators’: Current Trends in Deferred Prosecution Agreements, 45 AM. CRIM. L. REV. 159, 188 (2008) (noting that most observers “contend that diversion agreements actually have replaced declinations, providing prosecutors with an opportunity to extract a pound of flesh when previously they would have had to settle for nothing.”); Matthew E. Fishbein, Why Individuals Aren’t Prosecuted for Conduct Companies Admit, N.Y.L.J. (2014) (“Prosecutors’ increasing appreciation of the leverage they enjoy over corporate entities, coupled with companies’ determinations that a ‘bad’ settlement is likely better than a ‘good’ litigation, has resulted in a greater number of corporate settlements in cases where the government would be unlikely to prevail if forced to prove its case in court.”). Similar complaints have been leveled at plea agreements. See Reilly, supra note 28, at 350 (“‘when a prosecutor offers a defendant the opportunity to plead guilty in exchange for a more lenient punishment, the offer may lead an innocent defendant to plead guilty.’” (quoting Adam N. Stern, Note, Plea Bargaining, Innocence and the Prosecutor’s Duty to ‘Do Justice,’ 25 GEO. J. LEGAL ETHICS 1027, 1027 (2012))). See Matthew E. Fishbein, The DOJ’s New Position on Corporate Cooperation, 48 REV. OF SEC. & COMMODITIES REG. 185, 186 (Aug. 19, 2015). A handful of individual defendants charged with FCPA violations have exercised their constitutional right to a jury trial. The results in these cases have been mixed, although several foreign nationals have prevailed on their claims. See, e.g., United States v. Bodmer, 342 F. Supp. 2d 176, 189 (S.D.N.Y. 2004) (dismissing FCPA charge against a Swiss national); United States v. Castle, 925 F.2d 831, 836 (5th Cir. 1991) (dismissing indictment against foreign officials and holding that foreign officials could not be prosecuted under the FCPA or under the general conspiracy statute for conspiring to violate the FCPA); United States v. Hoskins, 123 F.Supp.3d 316, 327 (D. Conn. 2015) (holding non-resident foreign national could not be charged with conspiracy to violate the FCPA unless the government could show that he acted as an agent of a “domestic concern” or while physically present in the United States). See Koehler, supra note 14, at 548-49; see also Fishbein, Why Individuals Aren’t Prosecuted for Conduct Companies Admit, supra note 35. If a legal theory is rejected, the government may lose not only the case, but the ability to raise that theory in other enforcement actions. This scenario is currently playing out in United States v. Hoskins, where the district court for the District of Connecticut significantly curtailed the government’s reliance on theories of accomplice and accessorial liability in FCPA prosecutions. See Hoskins, 123 F.Supp.3d at 325 (holding that the government could not override Congressional intent by bringing a conspiracy claim against a foreign national who could not be charged directly with a substantive FCPA violation). That decision is currently on appeal. See Koehler, supra note 14, at 530-41; Jed S. Rakoff, The Financial Crisis: Why Have No High-Level Executives Been Prosecuted?, THE N.Y. REV. OF BOOK (Jan. 9, 2014), available at http://www.nybooks.com/articles/2014/01/09/financial-crisis-why-no-executive-prosecutions/ (noting “the shift that has occurred, over the past thirty years or more, from focusing on prosecuting high-level individuals to focusing on prosecuting companies and other institutions.”). Even the DOJ acknowledges that “the public won’t see the impact of these steps over night.” See Yates, Remarks at the New York University School of Law Announcing New Policy on Individual Liability in matters of Corporate Wrongdoing, supra note 5. See Rakoff, supra note 38 (observing that “not a single high-level executive has been successfully prosecuted in connection with the recent financial crisis,” and that “the failure of the government to bring to justice those responsible for such colossal fraud bespeaks weaknesses in our prosecutorial system that need to be addressed.”); William D. Cohen, Instead of Wall St. Prosecutions, Holder Delivers a Deadline, N.Y. TIMES (Feb. 27, 2015), http://www.nytimes.com/2015/02/28/business/dealbook/insteadof-wall-st-prosecutions-holder-delivers-a-deadline.html (observing that “exactly zero individual Wall Street bankers, traders and executives have been successfully prosecuted for their role in inflating a real-estate bubble that cost investors hundreds of billions of dollars in losses and millions of ordinary Americans their jobs when it exploded.”); Whisler & McFadden, supra note 24 (noting “criticism from lawmakers, judges and commentators for a pattern of massive corporate settlements relating to widespread malfeasance but that often fail to result in anyone being prosecuted for the misconduct.”). See Fishbein, The DOJ’s New Position on Corporate Cooperation, supra note 36, at 188 (suggesting that “the DOJ’s [Yates] policy is unlikely to have an impact on the marginal cases, where companies often settle in spite of the evidence – not because of it.”). Yates, Remarks at the New York City Bar Association White Collar Crime Conference, supra note 2 (“Compliance officers have said that our focus on individuals has helped them steer officers and employees within their organisation toward best practices and higher standards … There is a real deterrent value in the prospect of being named in a civil suit or having a civil judgment. And this kind of deterrence can change corporate conduct.”). Of the 14 corporate groups that have been criminally prosecuted since the release of the memo and the three corporate groups that the DOJ declined to prosecute pursuant to the pilot programme, all but one have agreed in writing to provide the government with relevant facts about the individuals involved in the misconduct.